Seven Guns Press, 9780989946100, 360pp. After fighting a goblin army, befriending an ancient werewolf, and battling two fire breathing dragons during his adventures at the Monster Hunter Academy, Jack Templar hoped for a rest. No such luck. 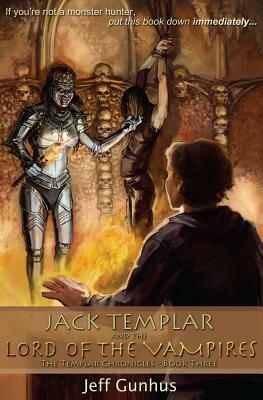 In this third adventure of the Jack Templar Monster Hunter series, Jack embarks on a quest to track down and acquire the first of five mythical Jerusalem Stones, an ancient power source found by his ancestors, the Templar Knights. Only the reunited Stones can stop Ren Lucre, the Dark Lord who holds Jack's father hostage and prepares for an all-out war against an unsuspecting human world. A different Creach Lord holds each Stone, and recovering them will not be easy. Jack and his friends begin their quest by seeking out a powerful and terrifying adversary, the Lord of the Vampires. The fate of the world rests on Jack's shoulders and he will be tested like never before. Join Jack Templar on his most dangerous journey yet, but remember that doing so makes you part of his world. Read this book only if you are prepared to battle the Creach and live by the monster hunter motto. Because to survive, you must... Do your duty, come what may.